These Chewy Lemon Cookies combine tart and sweet flavors in one easy drop cookie recipe. And better yet, these are soft, not crunchy. The expression must have been coined specifically for other lemon cookie recipes - those yielding a crumbly collection of broken pieces. It’s no wonder that lemon drop cookies have not gained the foothold of more popular cookie types. Too often lemon cookies have a lackluster flavor and an over-crispy texture. But this recipe makes soft, chewy lemon cookies and packed with just the right amount of bite, thanks to three kinds of lemon: fresh lemon, lemon flavoring, and lemon juice. Use butter, not margarine, for a denser flavor and softer texture. Lemon lover? You’ll love these. In a medium bowl, combine flour and baking powder. Set aside. Separate one egg. Reserve egg yolk for the cookie dough. Save the egg white for another recipe. Grate 1-2 tablespoons lemon zest. Set aside. Squeeze remaining lemon juice into a liquid measuring cup. Add 2 teaspoons lemon flavoring to the measuring cup. Add lemon juice to measure a combined total of ¼ cup. In a separate bowl, with an electric mixer on medium speed, cream together butter and sugar until smooth. Beat in egg and egg yolk, lemon rind/zest, ¼ cup lemon juice/flavoring, and 5-6 drops yellow food coloring, scraping the bowl constantly. Gradually stir flour mixture into creamed mixture until well blended. Dough will be soft. Pour about ½ cup granulated sugar into a bowl. Scoop cookie dough into walnut-sized balls. Roll balls in sugar. Place on baking sheets 2 inches apart. Bake for 9-10 minutes. Remove cookie sheets from the oven. Allow cookies to sit for 5 minutes before using a spatula to transfer them to a wire rack. Cool completely. Use a heaping teaspoon of cookie dough to make 2-inch cookies. If you drop bigger amounts of dough, bake cookies longer. The cookies are ready just before edges turn brown. Their texture remains soft even after they cool and get firm. Check out more easy drop cookies on our Drop Cookies Pinterest board. 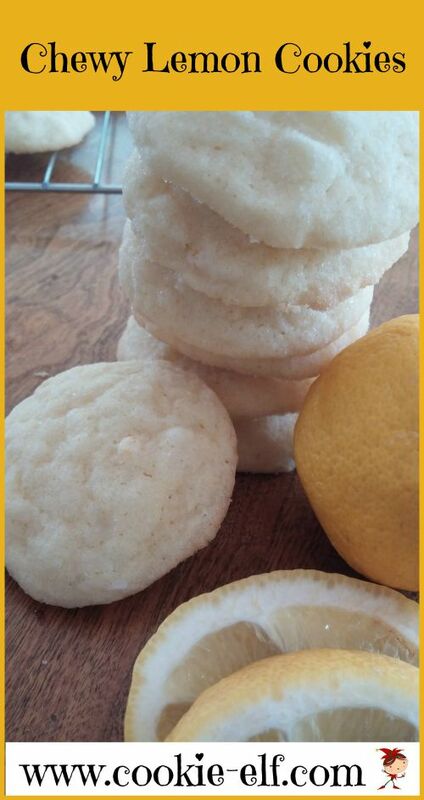 Lemon Crinkle Cookies: make them from a mix!